With hopeful hearts, we ask that you join us on another peaceful walk in support of faith and spirituality. The bloodline, the sacred circle of life, yours and ours, calls on us to walk together in the aura of Creator’s love for the betterment of water and all which need it to live. Let the “Spirituality is Unity” walk become your individual statement, declaring that you will not stand idly by while foolish, visionless politicians and greedy developers ready themselves to destroy an ancient sacred place located in the heart of Algonquin Anishinabe territory. 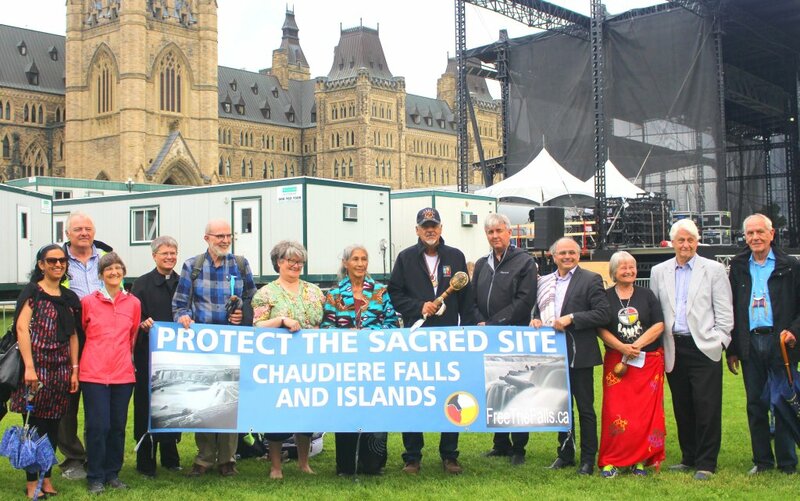 The Spirituality is Unity walk will occur on the traditional lands of the Algonquin Anishinabeg, beginning at 10:00 am on Victoria Island (Booth St. entrance) and ending on Parliament Hill at approx. 1 pm. The date is June 22, 2018, the Friday marking the second day of the Summer Solstice Indigenous Festival at Vincent Massey Park. This Walk welcomes the presence of children. It is for them after all, that we are doing this. If possible, bring your children, bring your grandchildren. Never forget that the grandchildren of your grandchildren will be the true beneficiaries of the actions we take today in protecting the water, the wind, the atmosphere and all the life of the forests, so that these things will be strong and energetic in the days of the distant future. Our dying planet does not cry out for more condos to be constructed for the wealthy people of the land to live in. Mother Earth demands that prayer and ceremonies commence afresh at our sacred sites. Never in the history of mankind has there been a stronger need for the spiritual beliefs of all faiths to ignite, as one, a healing fire in the centre of the sacred circle. The Spirituality is Unity walk is necessary. Something needs to be done to prove to Creator that not all of us have lost our minds. No one wants war, least of all a nuclear one. Drug epidemics are killing our children as well as those of the non-native community. Newspaper stories are telling us that human clones can now begin to be produced. It’s insanity! The politicians will only wake up to the seriousness of it all when the faith leaders with one voice tell them “Enough!” We all need water to live! Even the politicians cannot live without it. Why don’t they get it? Do the politicians not hope for health and wellness for their descendants? This call to action is brought forward by Albert Dumont (South Wind) and Jane Chartrand (Grey Fawn). Click here for more information about the walk. PS – Click here for photos of last year’s Faith Is Peace walk! This entry was posted in Community, Idle No More, Spirituality and tagged Akikodjiwan, Albert Island, Algonquin, Anishinabe, Asinabka, Chaudière Falls, Chaudière Island, condos, DreamCorp, faith, Faith Is Peace, GoFundMe, Great River, Justin Trudeau, Kichi Sipi, Lebreton Flats, OMB, Ottawa, Ottawa River, Petition, Reconciliation, sacred land, sacred waters, spirituality, unceded, UNDRIP, Victoria Island, Windmill Development Group, Zibi. Bookmark the permalink. Yes, I’ll come from Kingston and gladly support all you stand for. Grandfather William Commanda said “ginawayadaganuc”- we are all related across space and time. I will be happy to join for the walk.